The constellation Cepheus represents a King. It is faint, but its distinctive shape makes it easy to locate, if you look in the north on August evenings. Cepheus resembles the stick house we all drew as children – and that children today still draw – with a square for the base and a triangle for the roof. In the case of Cepheus, the tip of the roof (a star known as Gamma Cephei, or Er Rai) points generally northward. In the sky, “northward” always means “toward the sky’s north pole,” or toward Polaris. Thus, the roof of the house in Cepheus is pointing mostly north, even though – in tonight’s sky – that means it’s pointing sideways and downward. In Greek mythology, Cepheus represents a King of Ethiopia. To find Cepheus, you might want to locate a more prominent constellation, Cassiopeia the Queen. 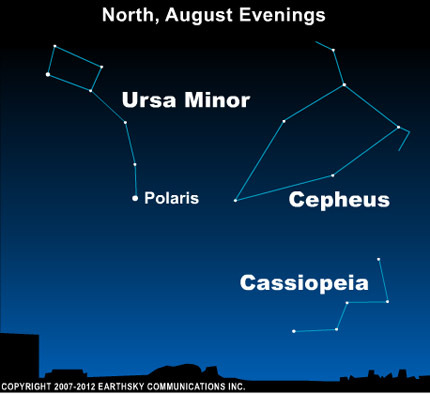 For more about Cassiopeia, see our chart for August 4, 2010. Will Mars appears as large as a full moon on August 27? Previous Story: Are We All Ideologues Now? Site contents copyright © 2019 Recorder Online	except as noted. All rights reserved. | 88 queries in 2.332 seconds.